Hello again! This is Ukrit Pongsathaporn back with another post about LINE Things. This post will be going over the capabilities and features of the demo device to be used with LINE Things. Today, we’d like to introduce you to LINE Things’ latest device, LINE Things E-card (Bluetooth Low Energy Electronic Display)! It is a BLE-enabled e-ink display fully compatible with LINE Things. Currently, we are working on making the resource materials for the hardware public. The device will soon be an open hardware. If you have made your very own device, be sure to share them with us! We’ll let you know the moment the files are live, both on this blog as well as our Twitter. LINE Things E-card is designed to display text, images, and information of your LINE account. By utilising LIFF BLE with LINE Things, you will be able to display your favourite messages and images! The E-card was created with an idea to replace name tags in meetups and conventions. But we are merely scratching the surface of what the E-card could do. We hope to see what you can do with the E-card, so please let us know by posting it on Twitter with the hashtag #linethings. The power switch lets you to turn the device on and off, which allows you to power it on only when you need to interact with the device. When you push the Advertise button, the LED will be blinking. While in advertising mode, you will be able to see the LINE Things E-card device on the device link screen on LINE. Be sure to Advertise before linking your device! To save power, the device will automatically go into sleep if inactive for 3 minutes. When the device is in a sleep state, the LINE Things E-card is not available on the device link screen within the LINE application. In order to wake the device back up, you will need to press the RESET button, then the Advertise button. 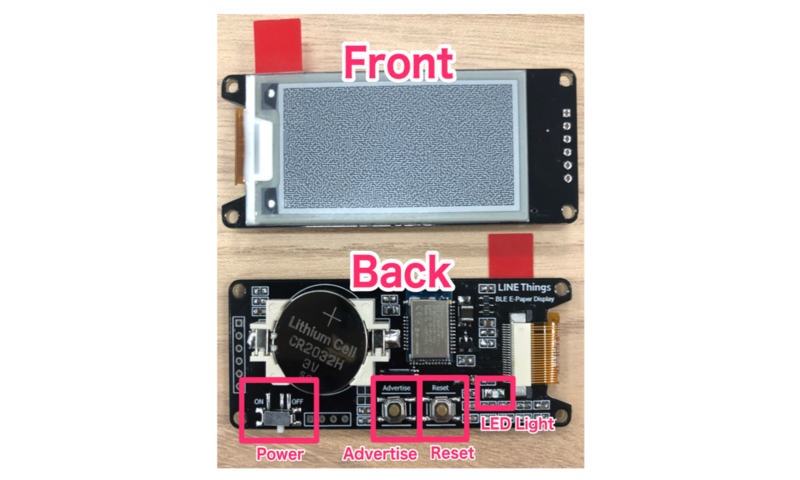 Again, the LED will be blinking and the device will be available on the device link screen as LINE Things E-card, ready to connect. If the LED is constantly lit, it means that the battery is low and needs a replacement. The device will not be able to advertise until the battery is replaced. Press the Advertise button on the device to perform a device link with LINE Things (just for the first time using the device). 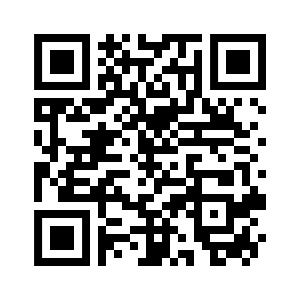 The simplest method to get to LINE Things device link screen is to scan the QR code below. Additionally, you can manually navigate to the device link screen by going to the Friends tab. From here, you will see a gear icon indicating the Settings menu. Tap on the gear icon and you will be able to see LINE Things as one of the available items in the menu. Tap on LINE Things to reach the LINE Things device link menu. This is a one time process. Once the device has been linked, you will no longer need to repeat this step. Press the Advertise button on the LINE Things E-card device and wait until “LINE Things E-card” appears on the list of available devices on the LINE Things device link screen. Tap on LINE Things E-card to start pairing with the device. When pairing and bonding is completed, LINE Things E-card will now be under My devices. Tapping this LINE Things E-card launches the LIFF app associated to configure your LINE Things E-card. After linking the device and launching the LIFF app, the LIFF app will scan for available devices. If the device is not on the list, you may need to press on the Advertise button again. Once LINE BLE E-paper Display is detected, tap on it to connect to the device. When a connection has been established, the screen will show the remaining battery level, the signal strength, and a configuration menu to write to the device. LINE: Displays the current LINE account information including the display image, display name, and status message. Image: Enables you to select an image and display the selected image. Let’s make a personal LINE contact card! First, select the LINE tab and confirm that the information is indeed your LINE account information. To send the data to the E-ink display, tap on the Refresh button and the information will be displayed on the E-ink display. If you did not set a status message, “undefined” will be displayed. If you would prefer to have something other than “undefined”, make sure to set yourself a new status message. You can change it by going to the Settings menus in LINE and to the “Profile” section. When pressing the Refresh button, the content on the device display is being sent to the device. Since BLE uses a low power operation profile, it may take up to 15 seconds to send the display data. Note: Due to the limitations of the e-ink display, your display image will be converted to two monochrome gradients. Depending on the colour scheme of your image, it is possible for the image displayed to be a solid white or solid black. Now let’s write some messages onto our card! Select the Text tab and enter any message you would like to display. Make sure your message is comprised of only alphanumeric characters. You have the options of 8, 10, 12, 16, 20, and 24 for font sizes. You can also set the offset coordinates of your message by entering values into X and Y. If you would like to add more text items to the E-ink display, simply tap the Add button. When you are ready to send the message over to your E-ink display, just tap on Refresh. Finally let’s send an image over to our E-ink display. Select the Image tab and tap on the Choose File button. Select an image you would like to use and tap the Refresh button. It may take up to 15 seconds before the image is sent to the E-ink display. So, what do you think? Pretty awesome right? Even though this post focused more towards the explanation of the device, I hope that you were able to get the feel and flow of how devices can interact with LINE Things. Unfortunately we do not have any plans to commercialise this device. However, the good news is that we plan to release all of the hardware design files and the source code of the firmware for the device to the public on GitHub soon! Gerber files will also be provided so that you will be able to assemble your very own LINE Things E-card! You can even customise the firmware to fully personalise your LINE Things E-card with additional features. We’re excited to see what you come up with so please don’t hesitate to post it on Twitter with the hashtag #linethings. But perhaps developing a practical hardware device may be a challenge for you. So I would like to encourage you to give our LINE Things Starter a go and see what LINE Things device you can make! We’re eager to see what you can make with LINE Things, so please share them with us! So, please keep an eye out for when an event is coming up!